Alabama Plate Cutting Company utilizes two 3000 watt LVD Impuls 4020 Laser cutting machines to cut tight tolerance metal parts. These LVD Lasers are equipped with dual 80” x 160” shuttle tables and are easily capable of maintaining tolerances of +/- 0.005” for material up to 0.875” thick. Lasers produce a high intensity light source the size of a pin head. The energy produced by this light source vaporizes metal. Controlled by CNC (Computerized Numerical Controls) this very narrow beam of high energy light can be directed and its movement controlled with pin point accuracy. The advantages of laser cutting are smooth edge quality, tight tolerance parts and a much smaller “heat affected zone” when compared to other thermal cutting methods. 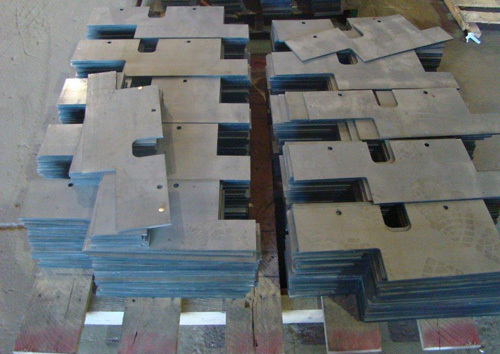 Let Alabama Plate Cutting Company show you the advantages of their laser cutting services.